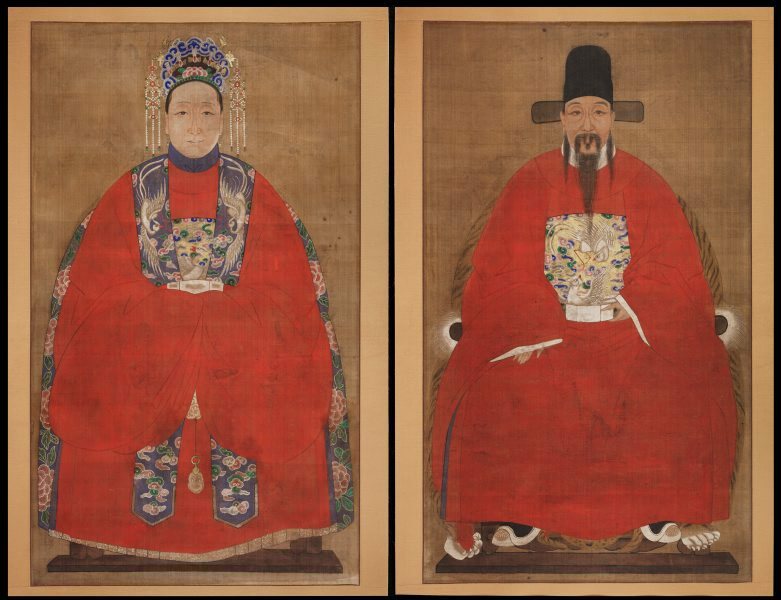 Ancestral portraits generally occur in pairs, depicting an ancestral married couple, formally seated, and richly dressed in robes appropriate to their rank in the hierarchy of traditional Chinese society. These figures are appropriately dressed in elaborate clothing and jewels to show the importance they held when they were alive The paintings clearly show a husband and wife, confirmed by their rank badges. The badges look to portray the silver pheasant (baixian), which is the insignia of a 5th rank civil official. 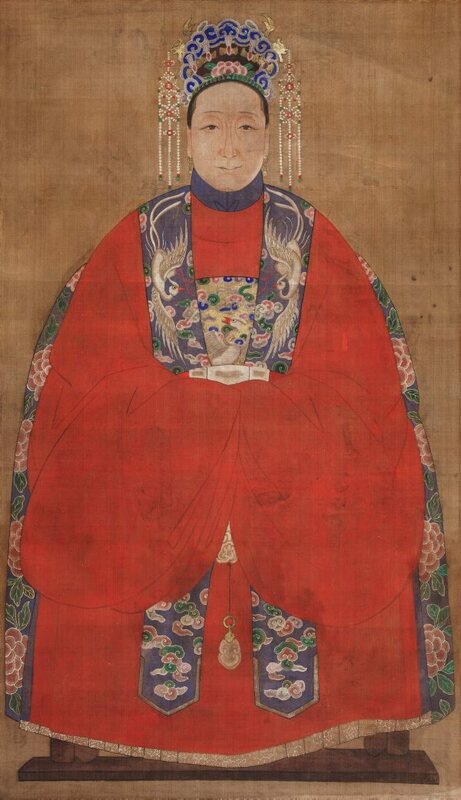 During the Qing period, wives was authorised to wear the same insignia as their husbands. However the bird's tail feathers also have similarities to the paradise flycatcher, the insignia of a 9th rank official. The images provide an example of how liberties were sometimes taken when painting such portraits. Set against a standard plain background, both figures sit on round chairs - he sits on an elaborate tiger skin, symbolising his wealth and power, she on a floral textile. Attached to the woman's clothing is a jade 'ruyi' charm which hangs towards the bottom of her garment. Other decorative ornaments hang from her headdress. As was often the case, her feet are concealed, while the man's feet are shown. 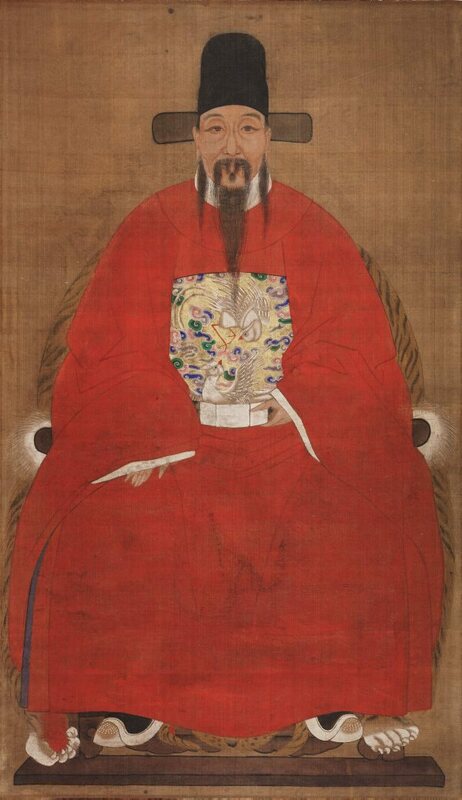 Ancestor paintings are usually unsigned and at times were worked on by multiple artists, for instance those who specialised in the painting of elements such as fur or eyes. Unlike literati paintings, these images were for the veneration of ancestors in the home, who it was hoped would provide good fortune in the lives of the living. Label in the Glorious exhbition in August 2018: "Ancestral portraits were created for the veneration of forebears in the home. They generally appear in pairs of formally seated couples richly dressed in robes appropriate to their rank in the hierarchy of traditional Chinese society. These portraits were often copied by later generations to replace a worn original. Sarah Couper, Look , 'Famiy Ties', pg. 26-29, Sydney, Sep 2015, 27, 29 (colour illus).